The heart of our story, like the beginning of creation, lies in the nature of light. Here we are confronted with mystery, and I say this not because of the perplexities of physics, but in view of what is the essential nature of light. Light, because it is primary, must be unqualified — impossible to describe — because it is antecedent to the contrasts necessary to description. While the foregoing is essentially a philosophical statement, the physicists would have much the same report. For the physicist, light is unique in that, unlike everything else that exists in actuality, it has no mass (no rest mass). It has no charge and, as evidenced by the finding of relativity that clocks stop at the speed of light, it has no time. (1) While light in a vacuum has a "velocity" of 186,000 miles per second, this velocity is not motion in the ordinary sense since it can have no other value. Objects can be at rest or move at a variety of speeds. Light, on the other hand, has but one speed (in any given medium) and cannot be at rest. Even space is a meaningless concept for light, since the passage of light through space is accomplished without any loss of energy whatever. Light involves us in a special kind of difficulty, the difficulty of knowing about that which provides our knowledge of other things. We might imagine a painter who wanted to paint the paintbrush, a problem I encounter when I want to repair my glasses: I cannot see without them; and light, by which we see, cannot be seen. This sort of Zen paradox is not appreciated by the scientist, who likes to think of light as "just another kind of particle." This interpretation does not stand up under examination, for to call that which is outside of space and time, and which has no rest mass, "just another kind of particle" is a placebo for materialists rather than a correct description (see p.6). Light is not an objective thing that can be investigated as can an ordinary object. Even a tiny snow crystal, before it melts, can be photographed or seen by more than one person. But a photon, the ultimate unit of light, (2) can be seen only once: its detection is its annihilation. Light is not seen; it is seeing. Even when a photon is partially annihilated, as in scattering of photons by electrons, what remains is not part of the old photon, but a new photon of lower frequency, going in a different direction. An ordinary object can be thought of as a carrier of momentum, or energy, which it can impart to another object. A hammer striking a nail exerts a force which drives the nail; a bowling ball conveys energy which knocks over the pins. In both cases, the hammer and the bowling ball remain after the work is done. With light, however, its transport of energy from one point to another leaves no residue. Light is pure action, unattached to any object, like the smile without the cat. This light energy is everywhere, filling the room, filling all space, connecting everything with everything else. It includes much more than the light we see by, for all exchange of energy between atoms and molecules is some form of what used to be called electromagnetic energy, which extends over a vast spectrum and would be better named interaction. Visible light covers just one octave in that spectrum. We have said that light is unqualified, by which we mean that the usual ways in which we distinguish one object from another are not available for its description. However, light does have frequency and wavelength. The frequency is the velocity of light divided by wavelength. The visible-light wavelengths are recognizable as color, red light having long wavelength and low frequency, and violet light shorter wavelength and higher frequency. Over the range from red to violet, the frequency of light doubles (one octave). The entire range of wavelengths of light, between that commensurate with the diameter of the proton ( centimeter) and the long waves used in transatlantic radio, covers at least sixty octaves. Newton first observed the decomposition of white light into colors when he caused a narrow beam of sunlight in a darkened room to pass through a prism and fall on a screen. He considered light to be corpuscular in nature, i.e., to consist of tiny particles. Observing the rings, or interference fringes, visible when a curved glass surface rests on a flat one, he surmised that the corpuscles must have a periodic nature, but he denied that they were waves. 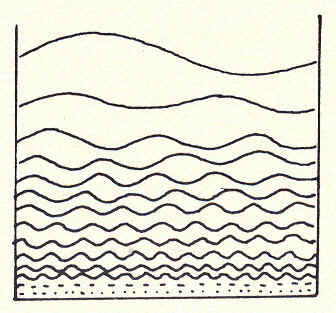 Huygens proposed the wave theory in 1690. After commenting on the extraordinary speed of light and the fact that its rays interpenetrate without impeding one another, he urged that light could not be due to transmission of matter, as for instance a projectile, but must, rather resemble the transmission of sound through the air. This motion, he concluded, must be gradual and spread in spherical waves, similar to waves in water when a stone is thrown into it. So great was Newton's authority, however, that the wave theory did not gain general acceptance until 1800. Let us note that in both theories there is a dependence on something material, either the corpuscles or the medium in which the waves are conceived to be transmitted. The 19th century ushered in the discovery of electricity. Galvani's experiments with frogs' amputated legs led Volta to his electric battery. The battery led to electric currents in wires and to Ampere's formulation of the laws which relate electricity to forces. Finally, the brilliant experiments of Faraday brought all electrical phenomena together under his theory of a field in which "lines of force" were invoked to account for action at a distance. 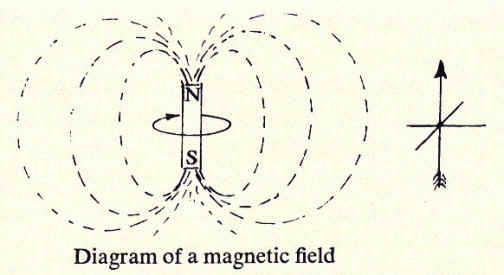 The magnetic field, as already mentioned in the Introduction, is toroidal in shape. It was therefore an extraordinary achievement when, in 1873, James Clerk Maxwell was able to bring all of Faraday's theory of fields and the wave theory of light under one general mathematical formulation. This formulation could explain light, electricity, and magnetism; it also predicted radio waves, which were soon confirmed by Hertz. The wave theory of light required the existence of an all-pervading ether as the "agency" for the transmission of electromagnetic forces. The ether, while it solved the vexing problem of action at a distance, created new problems. Force was explained as a "strain" in the ether, but in order for the strain to travel at the speed of light, it would be necessary for the ether to possess a rigidity millions of times greater than the rigidity of steel (according to de Broglie, a modern physicist, its rigidity would have to be infinite). The ether seems a remarkable example of how far people will go to shore up and thus obscure faulty thinking rather than abandon a mistaken premise, i.e., materialism. But this absurdity did not dislodge the theory of an all-pervading ether. It was only when, in the 1880's, the experiments of Michelson and Morley compared the speed of light perpendicular and parallel to the earth's motion, and showed no difference — and therefore no way of detecting motion with respect to it — that the ether hypothesis began to be questioned. To explain the photoelectric effect, Einstein in 1905 called upon the theory that had been proposed by Planck in 1900, that light is transmitted in whole units, or quanta of action. These quanta of action, also called photons, are the dynamic counterpart (3) of the more familiar atoms of matter, and are transmitted without attenuation. 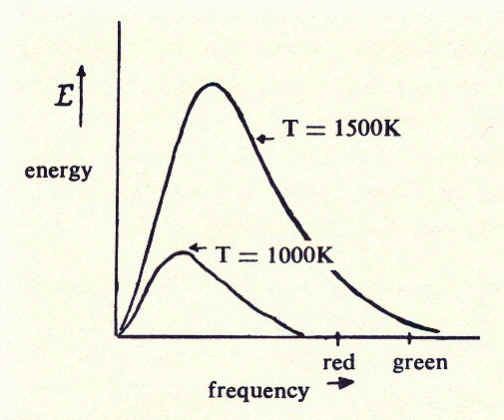 This theory held that the photon contains an amount of energy (E) proportional to its frequency (F). Because the energy of the photon (determined by its frequency) is not diminished with distance, the photoelectric effect is accounted for. But the quantum theory had to wait a long time for its acceptance. When the evidence came in, it was overwhelming. For example, the discovery of Heisenberg, to which we have already referred, that the electron cannot be observed without being disturbed, was found to require Planck's theory. For, in this case, the product of the uncertainty of position times the uncertainty of momentum is also a quantum of action equal to Planck's constant. 1. That light is radiated in whole units which do not dissipate their energy on the way to their targets (quanta of action). 2. That all energy exchange at the atomic and even the molecular level is in terms of quanta of action (light). 3. That action, like matter, comes in discrete whole units which cannot be divided. Since there is a lower limit to the frequency in a given size of box (its wavelength can be at most twice the size of the box), and there is no upper limit, classical theory predicted that the energy would be absorbed by the higher frequencies. The result would be what was known by the engaging title: "the ultraviolet catastrophe." Thus an object, as it is heated, first gets red hot, then white hot, moving toward the blue only as the temperature increases. It requires more energy to radiate at the higher frequency. It was to explain this unexpected distribution that Planck assumed the energy is radiated in packets whose energy is proportional to the frequency. That is, Energy x Time = Constant. This is Planck's constant and is the unit of action. Thus it required increasingly more energy to supply the high-frequency vibrations (like more talent to fill executive positions, so that it remains true that there is room at the top despite the housing shortage). That greater energy is required for shorter wavelengths of light (that are higher frequency) is not what one would expect on the basis of sound and water waves, which require more energy the longer they are. This is only one of many ways in which quantum theory has acted as a check and a correction on rational intellect. Rational process is a splendid assistant but a poor guide in almost any field, especially in the fundamental questions where the normal polarities fade out or reverse. The difficult question is: what is action? This will become increasingly important as we proceed. Curiously, the notion of light as action was one to emerge quite early. It was observed in the 17th century that sunset occurred a little later than it would if light followed a straight line: light as it enters the atmosphere follows a curved path. This phenomenon is explained as due to the fact that the speed of light is reduced by the atmosphere. What is remarkable is that the path followed by the light through the layers of atmosphere is precisely that which gets it to its destination in the shortest possible time. 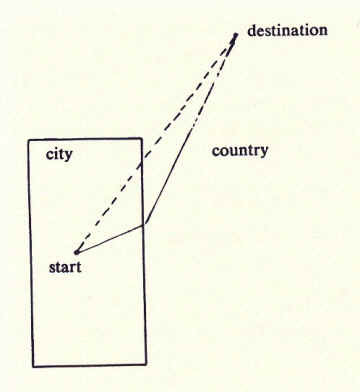 In driving from a point in the city to a point in the country, we can reduce the total time if we shorten the time spent in the city, even at the expense of going a longer distance. This law, that light always follows the path taking the shortest time, is known as the principle of least action. According to Planck again: [It] made its discoverer Leibniz and soon after him also his follower Maupertuis, so boundlessly enthusiastic, for these scientists believed themselves to have found in it a tangible evidence for an ubiquitous higher reason ruling all nature. As the reader is probably aware, the notion of purpose or teleology is forbidden in science, among biologists especially, who, while they must be strongly tempted to invoke it at every turn, avoid it as a reformed alcoholic avoids a drink. Physicists avoid it because their problems don't require it. But I do not wish to make an issue of this question of teleology here. Let us simply note one thing: that there is only one exception to the exclusion of purpose from science, and this exception is light, which these several scientists have seen fit to regard as having a purposive behavior. Let us also note that the purposiveness is associated with that aspect of light known as the principle of action (or least action). What did Planck add to this principle of action that was not already present in the ideas of Leibniz? It was the notion that action comes in quanta or wholes, and that this unit is constant. Note that despite the tendency to refer to energy as quantized — a habit which even good physicists are given to — it is not energy but action that comes in wholes. So far, except for the reference to purpose, I have kept within the bounds of accepted science. Now I would like to go further to track down this notion of purpose which Planck, and before him Leibniz, felt was indicated by the principle of least action. As we have noted, purpose is barred from science. As Bacon said: "Purpose like a virgin consecrated to God is (for science) barren." But as Whitehead pointed out in his Function of Reason: (6) "Scientists, animated by the purpose of proving they are purposeless, constitute an interesting subject for study." As Whitehead went on to say, we must distinguish "between the authority of science in the determination of its own methodology and the authority of science in the determination of the ultimate categories of explanation." Whitehead obviously wants to include purpose as an ultimate category of explanation. How may we include purpose in cosmology (the ultimate categories of explanation) while still excluding it from the methodology of science? We know that science builds its entire edifice on three measures: mass, length, and time, and their combination, and all scientific formulation can be expressed in these terms. Clearly, there is no evidence of purpose in any of these: it is not in mass, nor in length, nor in time. The only suspicion of it, as we noted, occurs in the formula for action. Action has the measure formula . This combines mass (M), length (L), and time (T). Is it possible that there is something present in the whole that is not in the parts? This is clearly the case here. Consider any device made of parts, say a bottle and its cork or a flashlight and its bulb. Is it possible to find the function of the device in the parts? Surely, no. Only when the device is put together can it express its function and its purpose, something its parts alone could never do. It was Planck's epoch-making discovery that action comes in wholes, a discovery which in retrospect we can see to be true of human actions. We cannot have 1½ or 1.42 actions. We cannot decide to get up, vote, jump out the window, call a friend, speak, or do anything one-and-a-half times. Wholeness is inherent in the nature of action, of decision, of purposive activity. Planck's discovery about light touches home: it is true of our own actions. But we didn't really know this until the physicists had made this a principle. Perhaps I should let it go at that. We are already pressing the mind beyond its limits. Nevertheless, let's go ahead and see what happens. Since purpose is in the whole and not in the parts, the whole must be greater than the parts. How can we account for this? Because the whole cannot function when divided. It follows that function is that aspect or "cause" which is not in the parts and which science cannot deal with, because science deals with mass, length, and time, which are parts. This leads to a basic cosmological postulate: the parts are derived from the whole, and not the whole from the parts. In other words, the whole exists before the parts (see Chapter XI). An additional consideration that confirms the fundamental nature of action is that actions are unqualified. While mass is measured in grams, length in meters, and time in seconds, quanta of action are counted with no necessity of specifying the kind of unit. This implies their fundamental nature; actions precede measure, they are prior to the analysis which yields grams, meters, and seconds. 1. Action comes in irreducible quanta or units. 2. These units are of constant, i.e., invariant, size. 3. They are counted, not measured. 4. Because indeterminate, they constitute the end point in the chain of causation and are therefore first cause. Our history of concepts of light in this chapter culminated in Planck's discovery that light is radiated in quanta, or whole units of action, h, whose measure formula is (or ). In the interest of completeness, we should here note that the quantum of action has yet another alias — angular momentum. For angular momentum and action have the same measure formula: . This need not make things more difficult, for angular momentum is a clearly defined concept and more easily understood than is the concept of action or uncertainty, and hence can aid in our understanding of action. But what is angular momentum? It is the momentum of a spinning weight. 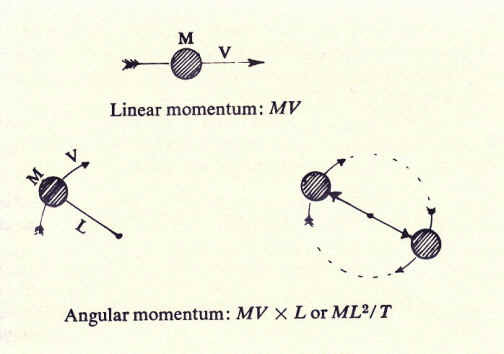 Linear momentum, which does not involve spin, is the momentum of a hammer or of a car hitting a telegraph pole and is a product of mass times velocity, i.e., MV or ML/T since V, or velocity, is length divided by time. But angular momentum is linear momentum times the radius around which it spins, ML/T X L = . Thus a weight spinning around an axis or two weights spinning around a center possess angular momentum. If we imagine that the wire holding the weights breaks, then we can explain the uncertainty (of the quantum of action) as our uncertainty about the direction in which the released weight would fly. Thus angular momentum "packages" momentum so that it no longer requires, as does linear momentum, a velocity of translation to exist. For example, a spinning flywheel has angular momentum and hence can store energy, even though the flywheel remains in one place. Yet the flywheel can be transported and thus convey its stored energy. This helps answer the long-standing question of action at a distance. For according to this theory, light contains energy in its angular momentum, and can thus transport this energy from one point to another. Newton's corpuscular theory could not explain the transmission of different amounts of energy, because the corpuscles, which must move at the speed of light, all have the same speed, and could thus not account for the great difference in light energy. 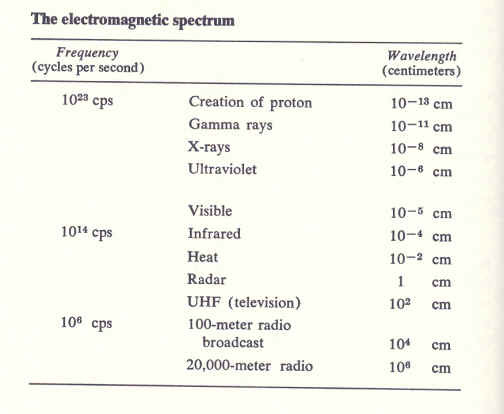 (See — The electromagnetic spectrum — above.) Alternatively, the wave theory could explain the transmission of energy only by postulating an infinitely rigid ether. Moreover, Planck's constant — the quantum of action — can contain any amount of energy. This may be understood by the example of a skater or ballet dancer who, giving his body a whirl with arms extended, makes himself spin faster by drawing his arms in close to his body. In the case of the photon, there is no smallest size, and — as the radius is decreased — the spin gets faster and faster (the frequency of the photon increases). This faster spin has more energy, and there is no upper limit. But where does this energy (for the skater) come from? It is produced by the skater in pulling in his arms against centrifugal force — and would be greater if the skater held weights in his hands. Of course, with the skater there is a limit to the rate of spin or the energy he can store in this way because he can pull his arms in only so far — but the photon, having no bulk, can shrink any amount. It follows that a single photon can store unlimited energy by getting smaller! This is one of the most surprising findings of quantum physics — that the smaller the photon, the more energy it contains. It is a reminder of the great difference between the world of light and the world of matter. No time, space, charge, or mass. Energy increases as size (wavelength) is reduced. Time, space, charge and mass. Energy (mass) decreases as size is reduced. Any velocity less than the speed of light. This chapter has been devoted to establishing a connection between light, purpose, and first cause. We have shown — how science, in regard to its understanding of light, has been put through the hoop, having been forced to reverse itself twice: from "corpuscles" to wave theory to quanta of action. We may therefore appreciate that light is not "just another particle," nor is it describable as most things are in terms of something else. It is the base element. We have given some account of Planck's discovery of the quantum of action, or photon, as the ultimate unit of light, and have indicated the connection of action with purpose. We have noted that purpose, inasmuch as it is decision, comes in wholes, and that there is a necessary connection, in that when wholeness is divided, purpose or function ceases. We conclude that light is the unitary purposive principle which engenders the universe, and that it has the nature of first cause. 1. The space-time path of light has zero length. 2. The neutrino, if it exists, is no less insubstantial than light. 3. Eddington described photons as "atoms of field action." 4. Planck, Max. Scientific Autobiography and Other Papers (p. 178). Translated by Frank Gaynor. New York: Philosophical Library, 1949; Greenwood Press, 1968 (reprint). 6. Whitehead, Alfred North. The Function of Reason. Princeton: Princeton University Press, 1929.